Create a multi-surface learning environment on a budget is simple using paper tablecloths. Table Paper can be bought from most large supermarkets. Asda sell a pack of four for p and currently have this brightly coloured ones on offer for 50p. Alternatively banquet rolls are very handy, like this one available from Amazon. Magic whiteboard is an absolute classroom essential with a multitude of uses, check out this magic whiteboard now with a grid. This can be used again for group work in the same way as the table cloth, place one sheet in the middle of each group table, with pens and wipers. I used the white board in this way whilst doing some Christmas relay races; check out our post Anything but More Past Papers for details of how to run a relay race. Also check out these relay race resources by Chris Smith, as well as the weighted relay race here all kindly uploaded to the TES. The advantage of using the whiteboard is that they can be wiped clean and used again. Check out Mr Collins post describing how he uses the magic whiteboard sticky notes instead of tracing paper here. Make the glass, the walls, floors and even the tables as learning surfaces! Using window crayons you can change windows/glass into a learning surface, check out our blog Who wants Clean Windows anyway for more details. 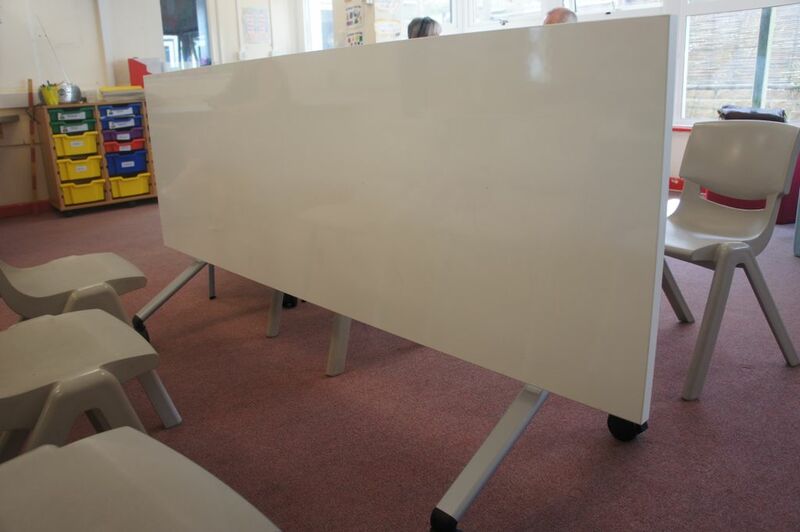 These can become learning surfaces using the magic whiteboard described above. My blue sky thinking and dream would be a department full of these write on and wipe off tables! Ikea sell this Gallant desk to the left which also wipes clean. Top tip from Professor Heppell and his post here is to give tables a good clean with polish, but as always test first. Good excuse for another trip to Ikea to stock up on Ikea rulers. Check out our post Teaching Loci of how to use the Ikea rulers. This kidney shape table is available from Flaghouse but be prepared for shipping, link here. I have found a picture of what I want, this flip write on wipe off table which flips into a display or presentation board. I think these from Merseyside Paper suppliers (page 10-11) are a possibility just need to check that the surface is dry wipe! If anyone has these type of flip dry-wipe table let me know as it would be great to get some! If I cant any or funding my alternative budget whiteboard tables will have to be created using a product like this dry erase paint and check out a school who have created white board surfaces using the paint here. Check out this post by Mr Adamson on his Living by Numbers Blog on how he uses his whole classroom.